Colin and his business partner, Tony Kettle, were both thrilled to meet Her Majesty The Queen at Buckingham Palace to receive The 2016 Queen’s Award for Enterprise in International Trade. Their company, Kettle Collective, was founded just over three years ago by Tony and Colin (who previously worked together at RMJM) and it has seen overseas business soar in the past few years. The company now has studios in Edinburgh and Dubai with local partners in Moscow, St Petersburg, Oman, Saudi Arabia and Beirut. 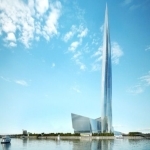 High-profile projects include the concept design for the last phase of the new headquarters for Russian energy giant Gazprom in St Petersburg which will become Europe’s tallest tower when complete in 2018. In the Middle East, the firm has designed four museums for the Saudi Royal Commission and it is currently working on a solar innovation centre for the Dubai Electricity and Water Authority. Photos show Colin at the Palace and the Gazprom Tower project.